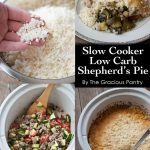 If you love shepherd’s pie, this clean eating slow cooker lower carb shepherd’s pie recipe is a great way to let your slow cooker do most of the work! Now that we are all in “Back To School Mode”, I’m ramping up on the slow cooker recipes. Because the truth is, when everybody gets back to the routine that Autumn usually brings, it not only takes a while to adjust but it also gets a little crazy-busy. Soccer practice, ballet lessons and all those fun things that get worked into the family schedule keep mom and dad running! Slow cookers are great for easing that schedule. They make life easier simply because you don’t have to stand over a hot stove for hours. You might have to brown some meat or saute’ some veggies, but overall, your time in the kitchen is greatly reduced. Better still is the fact that everything can cook while you run errands or play taxi. It’s the perfect setup for a busy life! 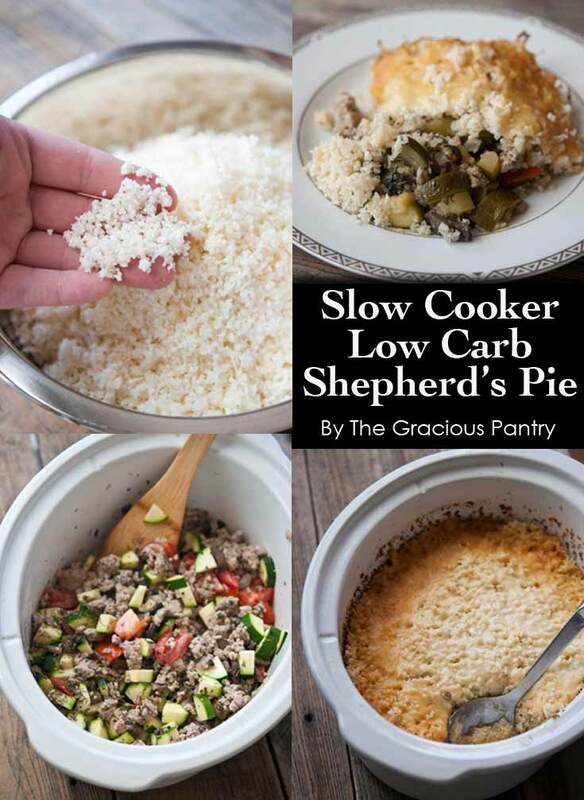 And this clean eating shepherd’s pie is just such a recipe. Recipe Notes: There will be a bit of water at the bottom when this is done cooking. Enjoy it as a delicious sauce! Loosely chop and core your cauliflower. Rice the cauliflower by chopping small amounts at a time in a food processor. Using a large skillet, saute the mushrooms and onions until the onions are transparent.. Transfer this mixture to your slow cooker crock. Using the same pan, brown the turkey and transfer that to the crock as well. Add the spices, zucchini and tomatoes and stir briefly to combine. Layer a single layer of the riced cauliflower over the top of the mixture in the crock. Then sprinkle the cheese over the top of that in an even layer..